It always seems to be the fourth or fifth day of a long tour that the physical wear and tear really starts to set in. Even though our daylight plan in the Freedom Challenge ensured plenty of rest, and nutrition was good, twelve-plus hours of riding and wrestling with a bicycle every day takes it toll. For me, wrestling with the bike caused major strain. I'm well-adapted to turning pedals all day, but I failed miserably in upper body strength department. It's not a natural strength to begin with, and I admittedly did almost nothing to improve it before the Freedom Challenge, reasoning that running would be training enough for the hike-a-bikes. I was wrong. My shoulders and neck ached, and my arm muscles felt tingly and weak. My legs were a patchwork quilt of cuts and bruises, including a swollen and painful bruise over my right knee that formed after I partially flipped over the handlebars on a cattle trail the previous day. The Freedom Trail beats up bodies in ways I hadn't experienced before on a long tour, and I was feeling it. While the crew at Ongeluksnek cooked up our breakfast of dark porridge, eggs, and steam bread, I massaged my numb biceps. As the four of us discussed the narrative for the coming day, Di seemed particularly stressed and Steve particularly excited — both of which I interpreted as cause for alarm. Tough nav day, coming up. 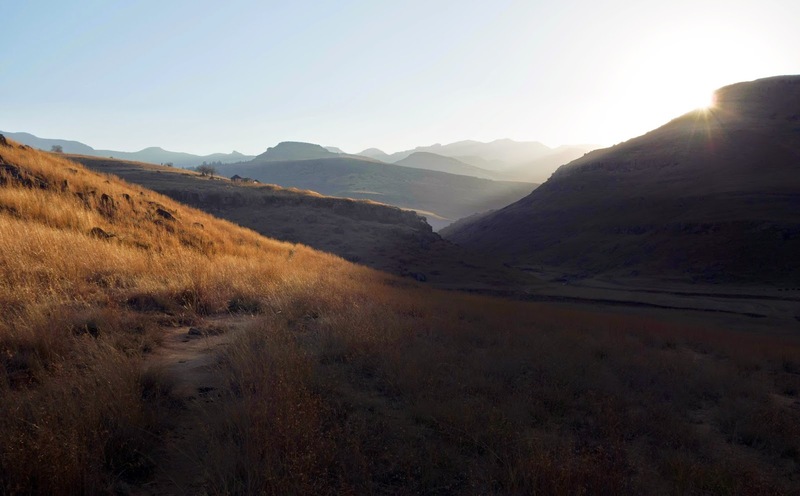 Steve was talking about finding an old wagon trail early in the day, but Di skipped right to "Vuvu Valley." "Vuvu Valley," she kept bringing it up. "If we are bumbling around in that valley after dark, we are screwed." Di went on to tell a story about a past year when she and her companions took on a tough portage late, and ended up spending the night huddled in a barn. "I was so cold I thought I was going to die," she said. "I really thought I was going to die." I was carrying a robust emergency bivy sack and some firestarters, and although I felt confident in the survivability of my system, I wasn't thrilled about the prospect of putting it to use when nighttime temperatures were dropping well below freezing. Before the race, I confidently (and mistakenly) assumed that if nights went late we'd just keep moving, neglecting to realize how navigation can become impossible at night. Darkness was as good as a wall in some places. We might actually get stuck somewhere outside overnight. I hated that I hadn't just planned my system with an assumption that we'd sleep out, and brought a sleeping bag and thin pad. I probably would have been less anxious in the afternoons with a real sleeping system as insurance. Also leaving Ongeluksnek were two Race to Rhodes riders who started one day later, Bruce and Ryan. They disappeared into the first gorge before us, and were already picking their way up the other side as we arrived at the edge of a cliff. "Now we must look for the wagon trail," Steve announced. He located a tumble of table-sized boulders, only slightly less vertical than the cliffs, and started down. "How did people ever get wagons down this?" I pondered out loud. "Well you see, the trail was much less eroded back then," Steve answered. "But they had all kinds of techniques; they'd lower them on logs." 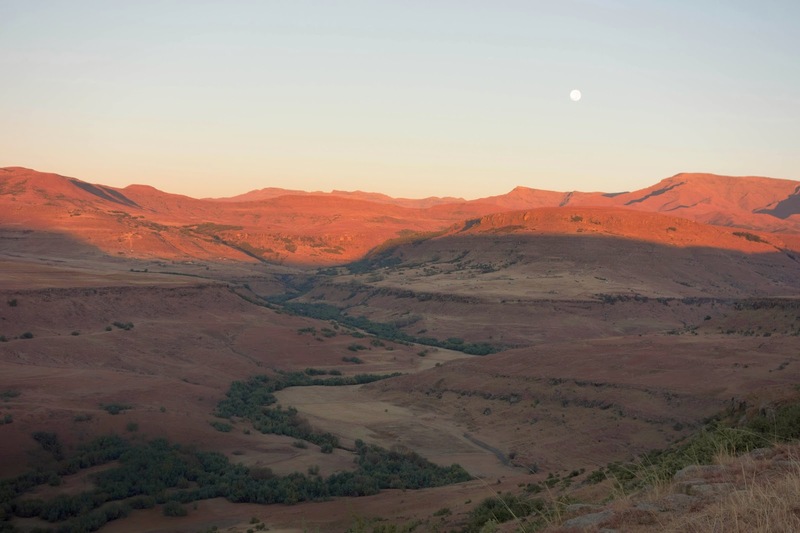 In the early colonial days of South Africa, wagon trains traversed the landscape via high routes — the reason being that necessary springs and streams were located in the mountains, so they had to stay high in order to travel long distances with water sources. Modern development arrived and roads stayed low. Although the wagon routes fell into disuse, many remnants remain. When David developed the Freedom Trail, he traced these historic routes, which is why public access is allowed through private lands. What exists today is sometimes hardly a trail at all — it's an overgrown doubletrack, or a faint footpath traveled by shepherds, or a string of tracks trammeled by sheep and cattle. A distinct characteristic of the Freedom Trail that I think not many North American mountain bikers would understand (I didn't) is that it's not a real trail. There is no trail development, no government funding, no earmarks for recreational use. It's just a series of points along the Great Escarpment, connected with a dotted line. As a North American, I'm used to routes that have been set aside, developed, and signed, and this simply isn't the case. At all. 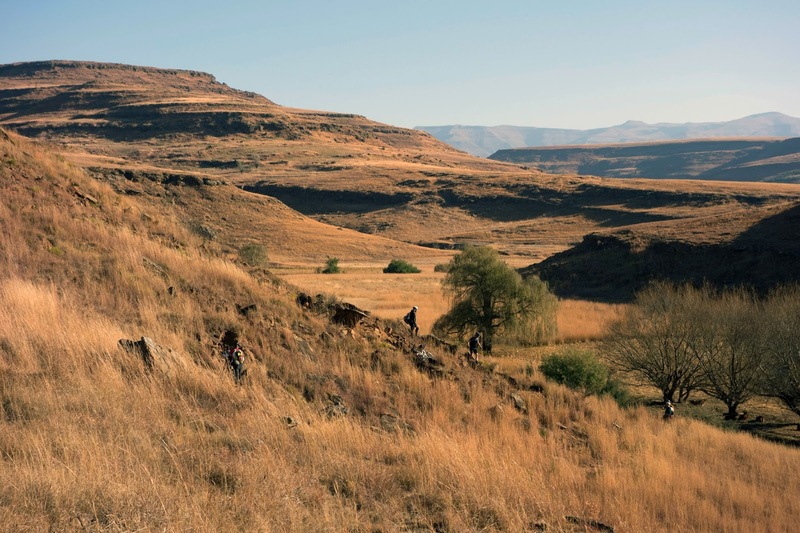 We climbed to a village called Black Fountain and proceeded along a broad ridge on a ripple of cattle trails — a sort of "choose your line" adventure on often rocky and overgrown singletrack. It became a tough technical challenge to keep up with Di and Steve, who are both strong riders, especially with my sore shoulders and dead arms that were even more reluctant than usual to pull up over obstacles. I was struggling but determined to stay with the experienced couple, especially after Di's foreboding description of Vuvu Valley. We aimed for the long way around a peak rather than scrambling up and over. Steve still managed to find a tiger line down near-vertical rock benches, into the village of Ngolilwe, which was slightly off route. This is another aspect of the Freedom Challenge I think many North American bikepackers would find strange. Here, there is so much emphasis on sticking precisely to a route, without any deviations. In the Freedom Challenge, the route is more of a suggestion. Although the portages are mandatory in the race — you can't just go around on roads — it's perfectly acceptable to develop one's own "sneaks" and other strategic offshoots of the established route. Finding the most aesthetic line is the aim of the Freedom Challenge. While this aspect was difficult for me, it's also one of my favorite things about this event. After a light lunch on the steps of Tinana Mission (mine was the last of the dried cherries and shelled pistachios that I brought from California), we encountered Bruce and Ryan riding out of the village. Apparently they had taken a bad line out of Black Fountain and ended up behind us. 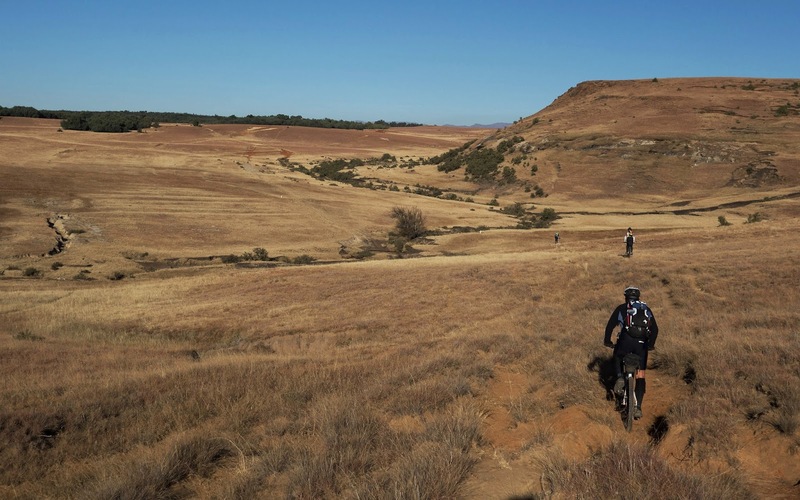 The friends from Pietermaritzburg had scouted much of the Race to Rhodes route in training, and informed us they had discovered a great route through the Vuvu Valley — rather than crossing the river multiple times and bashing through endless reeds, they found a high line that involved a lot more climbing, but was often rideable. Di was ecstatic at this prospect, and Bruce and Ryan seemed willing to team up with us. 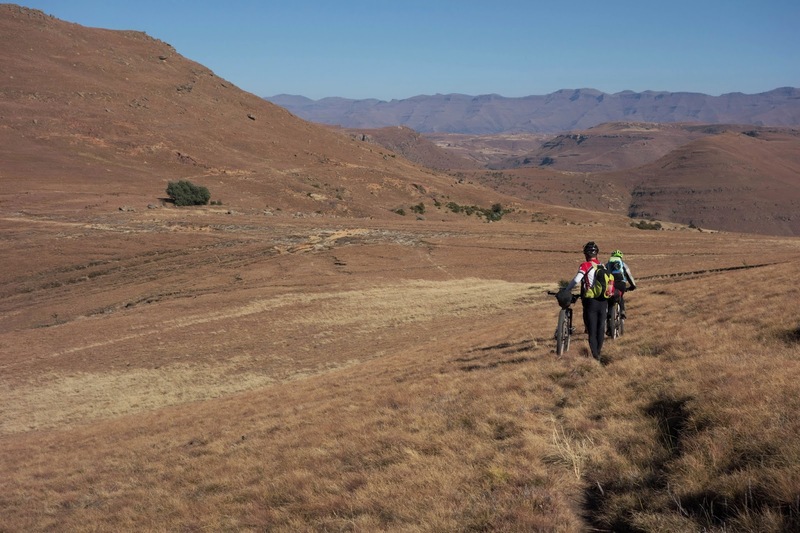 Liehann and I engaged our strong road legs to hold their pace through the rolling hills past several villages, and waited for Steve and Di while guzzling two-liter glass bottles of Coke at a spaza shop. We veered off the village streets and descended into the Vuvu Valley. Di had gotten me pretty riled up about this thing. The main river valley was fairly wide, and flanked by side valleys that promised confusion about whether one was still on course. Year after year, racers ascend the wrong canyon out of the Vuvu Valley and become terribly lost — finding themselves stranded below cliff faces, spending nights out, and sometimes skipping the checkpoint at Vuvu altogether. Anxiety levels were high, and I had this ominous sense of descending into the Heart of Darkness. We began bashing through six-foot-high grass, and I quickly fell behind. 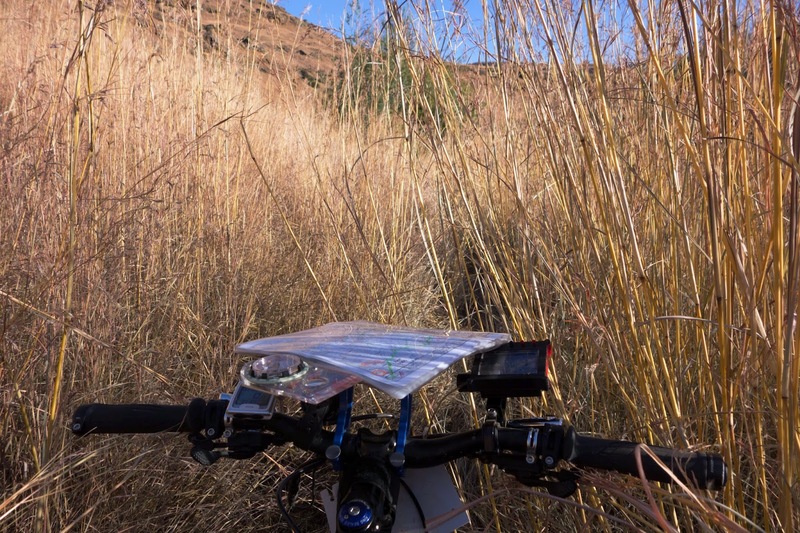 Amid thick vegetation on steep rolling hills, pushing the bike feels like wrestling a reluctant animal; I simply lacked a necessary component of strength and experience to do something I very much wanted to do, which is keep up with the group and not end up lost and alone in the Vuvu Valley. I wanted this with all of my being, to the point where my heart was racing as I gasped for air, and my shoulders and arms ached. My top limit wasn't good enough — and this was a humbling reality. I scanned my map to get a sense of where we were, but it was readily apparent that I'd either have to invest the time to study the thing and take compass bearings, or throw my own navigational understanding to the wind and race blindly after the group. I knew Liehann wouldn't leave me, but if I fell too far behind, there was a question of whether we'd fail to locate each other. 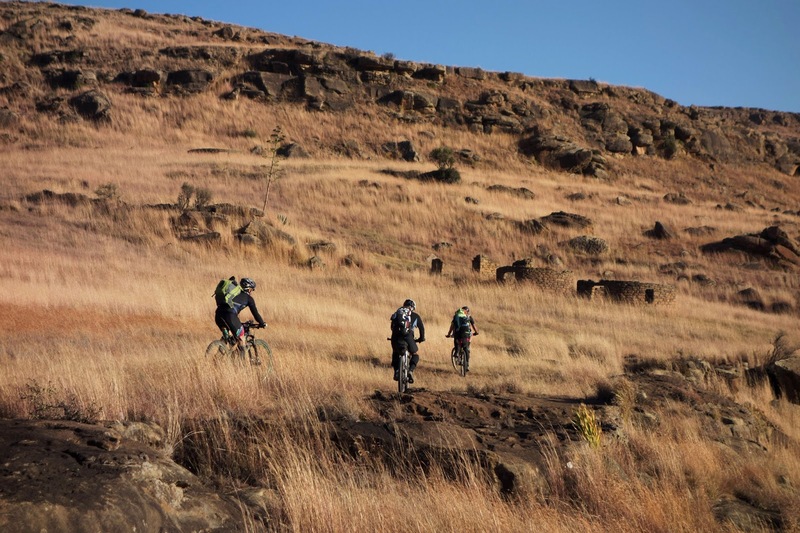 I bashed over a spur and caught sight of the group, riding along a rocky bench. Their path was something of a trail, but again was a technical challenge of uneven stone slabs hidden in tall grass. 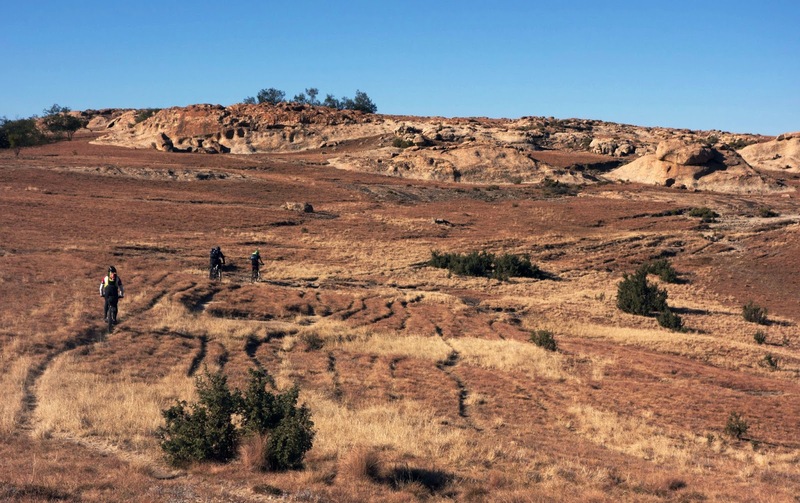 Much of it was stuff I normally wouldn't ride — I admittedly have never developed much skill for technical rock riding, and once I start getting bucked around I often get bucked off. I'd already taken a few disconcerting crashes in the Freedom Challenge, luckily walking away with only bruises, but one bad crash wouldn't just force me out of the race — it also would put me in a bad position far away from help. It wasn't worth the risk, and yet — what were my options? I laid into the pedals and hacked my way across the rocks, feeling that rush of exhilaration that one feels when everything is on the line. Liehann and I did end up both losing sight of the group at one point. We spent some time debating vague suggestions from the maps like "look for the lone tree" before we caught a glimpse of them scaling a steep face across the Tina River. This must be the line out of the valley, but it wasn't quite straightforward — there were multiple spurs jutting out, and I still wasn't sure whether this was the final climb, or whether we needed to descend and cross the river again. My energy levels were tanking but there was no time to eat anything; I fired up the willpower reserve and marched hard. The climb just continued to steepen, until we were scaling a veritable cliff on a staircase of three-foot-high boulders. A true scramble. I could see the others hoisting their bikes on their backs, but every time I tried to lift mine up, my rubbery biceps and shoulders simply failed — as though I had done too many reps of a heavy weight, and now there was no amount of willpower that would make them work. My ascent was a too-slow process of power-lifting the bike up onto a bench, propping it against the wall, and then using both arms to climb up myself. I watched the group disappear over a crest with an icy feeling of trepidation. In hindsight, the route was fairly straightforward and I would have been fine to work at my own pace until I reached Vuvu. But at the time, I had been so fixated at keeping up with them that my fatigued mind equated abandonment with doom. I was engaging everything I had to race up that mountain. Toward the top, something snapped. I became extremely dizzy, and the whole valley swirled around as I weakly gripped my bike against the rock face. The cliffs weren't too exposed, but a slip would have resulted in a fall of ten feet or more, and I could see those drops rushing toward me as I teetered on a ledge. It was only fifty or so more feet to the top; I was almost there. And yet, when I turned around to try to lift my bike, the dizziness became more pronounced. I gazed up helplessly at the group waiting at the top. 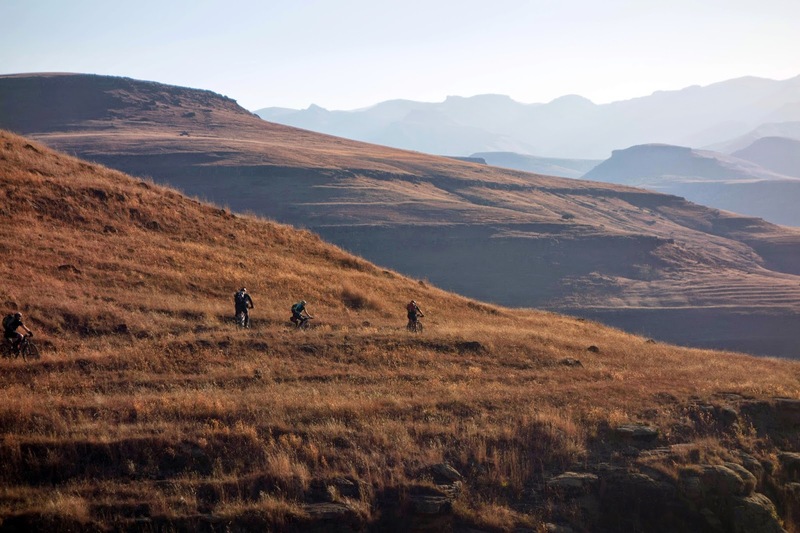 My struggle must have become blatantly apparent, because one of the Rhodes riders (I think it was Bruce, although I apologize that I don't remember exactly) scrambled back down and grabbed my bike, carrying it the rest of the way up. I followed behind him, still teetering as my legs folded underneath me and I balanced on my rubbery arms like an intoxicated ape. I felt both incredibly grateful and ashamed. At the top, I drunkenly stumbled toward Liehann — unable to even hold a straight line on solid ground. He ran toward me with a packet of Hammer Gel. "I thought you were going to fall of the edge," he said. "I thought so too," I stammered, and took the gel. Both of my hands were shaking violently as I struggled to open the packet. "I've never had a bonk like this. Never like this." 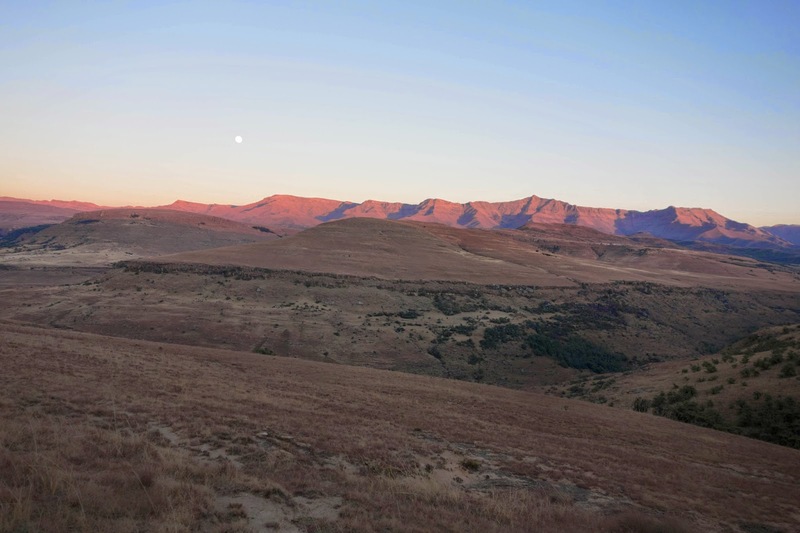 The last remnants of dusk filled the sky as the group pedaled into the village of Vuvu in full celebration mode. "Vuvu in the light! We made it to Vuvu in the light! Can you believe it?" Di exclaimed. My head was foggy and I felt ashamed. Defeated. My empty legs spun the pedals and I slumped over my handlebars, completely spent. Physically, this time. And mentally, too. "I'm not strong enough for this," I fretted to myself. "I'm just not strong enough." But this was not the time to give in to despair. I had to turn my mental game around and fast, because tomorrow, we would climb Lehana's Pass. Having Bruce and Ryan catch up to us at Tinana Mission is a great example of how important navigation is in this race. It doesn't matter how quick you are if you spend hours stuffing around trying to find the correct route. There are some great stories of people ending up in all kinds of odd places going up the Vuvu valley. 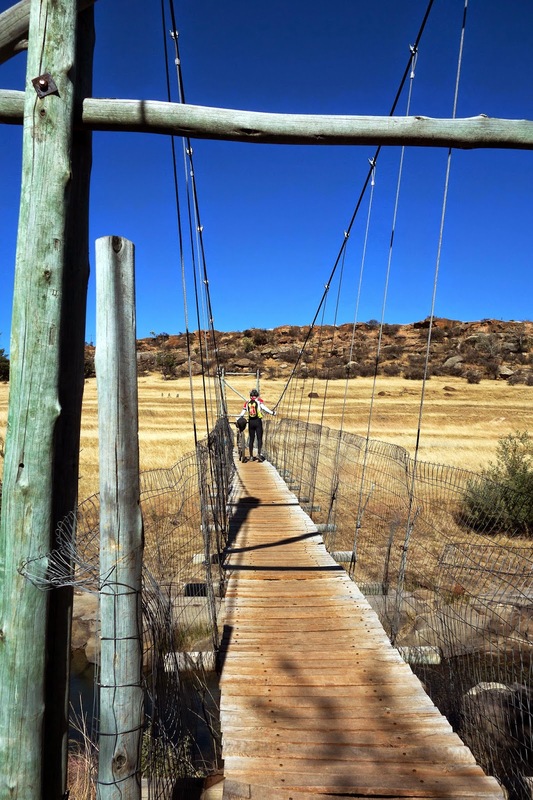 In one case they were headed toward Lesotho and David Waddilove sent a message scrawled on a cigarette packet up after them with a man on horseback. 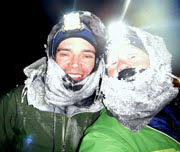 We got lucky being able to follow two guys who knew the route well but it also illustrates the dangers of following. I quickly lost where we were on the map - every spur running into the valley looks alike. The "lone tree" comment on the narrative didn't help much as there are plenty of trees that could be interpreted as "lone". You then have to pull out all the stops keep up with whomever you're following or you'll become really lost. Vuvu valley was one of those times and on the pure portage section I tried to be somewhere halfway between Jill and the leaders so that we still had some idea of where to go. The route we took is generally considered to be the best route as you have a quick but steep climb then ride an easy ride at the top of the valley to the village - mostly road even! The alternative requires a much longer climb. Jill wobbling towards me at the top was also a scary moment and I was really worried she was going to fall off the mountain. Arriving at Vuvu we caught up to 8 other riders. We went from mostly being 4 to a party atmosphere which was fun but also disarming, and being tired, a little overwhelming. Most of the riders were from the start day before ours and spent the night before at Tinana Mission after getting very lost coming down from Black Fountain. Despite trying to appear confident in my navigation skills Ntsikeni, Mparane Ridge, Black Fountain and Vuvu valley made me doubt them a lot. I either made bad mistakes (Ntsikeni) or couldn't work out where we were while following others (Vuvu). We had also made the mistake of printing our maps too small (A4/letter rather than A3) and many critical details were hard to pick out. Next time I'll print them larger, even blowing up the tricky sections onto their own sheets. Seeing Vuvu in the light was great though. There are some support stations where you arrive in the dark and leave in the dark and have no idea what they actually look like. I'm pleased to have taken Vuvu off that list. Such a 'gutsy' effort. Never feel ashamed! Oh boy. 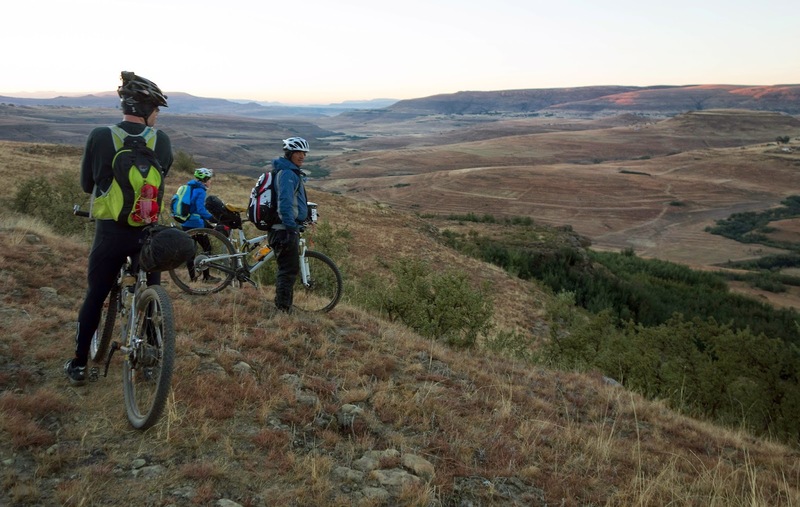 I remember crying and crying at Vuvu from fatigue and pushing bikes in thick sticky mud and then I remember the exhilaration of nailing the navigation the next year and arriving there early. That's the trail....an emotional and physical rollercoaster. What camera do you use? The pictures are abssolutely amazing. I'm impressed by your recollection and the accuracy of detail you're able to capture. In particular I'm enjoying your willingness to explore and expose your emotional state from day to day. That anxiety that takes hold when you are unsure you're lost or not, whether you'll make shelter before dark is draining. Reaching each SS is just so sweet.